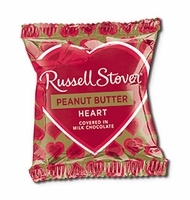 Russell Stover Peanut Butter Hearts. A milk chocolate shaped heart filled with creamy peanut butter. Tell your valentine how much you love them with these peanut butter hearts. Russell Stover is known for their delicious chocolates. A perfect mixture of chocolate and peanut butter.